Samsung is not going to introduce Dolby Atmos support on the Galaxy S8 and S8+ with Android Oreo. In response to a query about the possible inclusion of the feature, a UK Samsung Members community admin revealed that Samsung has no plans of implementing Dolby Atmos on the 2017 flagship pair with the next major software update. As you might know, a few days ago, an unreleased beta build of Android Oreo for the Samsung Galaxy S8 and S8+ emerged online. 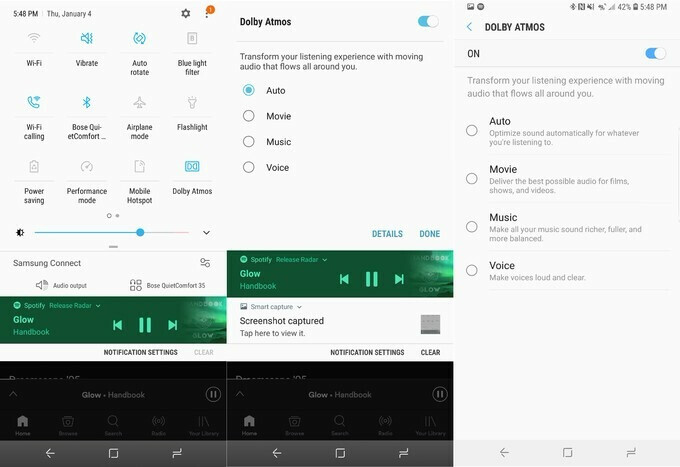 A major change observed by users who sideloaded the update on their phones was the inclusion of a Dolby Atmos toggle in the settings menu. The provided screenshots seemed to prove that this was a real thing, although users reported that the feature was not functional. If you're not sure what Dolby Atmos is, let us explain. It is an audio software, which fine-tunes EQ settings and surround emulation for when the user is wearing headphones. It is considered to be vastly superior to stereo and even surround sound, as it eliminates the whole "audio coming from different channels" approach. Instead, Atmos is capable of creating a complete sphere of sound all around you, which gives a big boost to immersiveness. Only a limited number of phones feature Dolby Atmos, the most notable of them being the Razer Phone and the Nokia 6. The leaked Oreo build gave us hope that the Galaxy S8 and S8+ might be joining that club, but sadly, this is not the case. They're saving it for S9. first the portrait mode for the camera and now this...so what the hell is the point of updating to oreo anyway?? ?